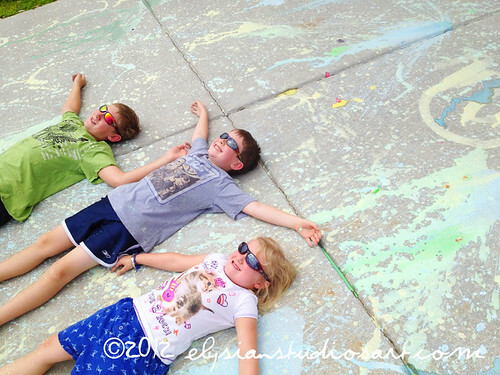 Whether you are trying to fill in a few more activities for the remainder of the summer, or want to add a hands-on art activity for your home school curriculum, here's a fun (and easy) way to teach kids about Jackson Pollock and Abstract Art. To begin, plan some time to introduce the children to "Abstract Art" and Jackson Pollock. To do this, you simply need a computer. Gather the kids around the monitor (or hook the computer up to your TV if possible). First, show them an example of "Representational Art." "Mona Lisa" is a good start. This is art where the subject is specific, and easily identifiable: usually a landscape, still life, or a portrait. Ask the children questions about what they see, and how they think the artists painted this type of work. Next, show them some "Abstract Art." "Guernica" is a good example. This type of art is much more subjective, and left up to the viewer to imagine what it is about: typically music, emotion, energy or color. Ask the children how this art makes them feel, and how painting "Abstract Art" might be different than the way they would create "Representational Art." This should get their creative juices going! 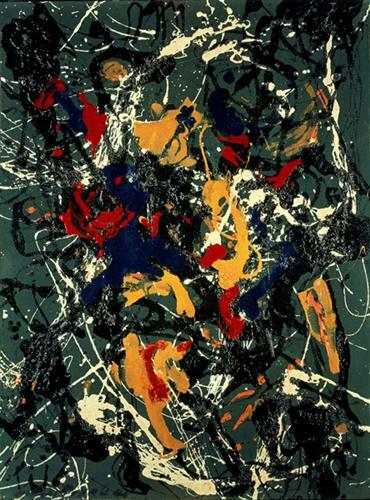 Now lets' talk about Jackson Pollock and his contributions to Abstract Art. Jackson Pollock's work is important, because for the first time, an artist was painting his Action. The drips, splatters, and swirls of paint were used to document the artist's movement. No one had ever done this before! While you are getting the last minute preparations made (and I do recommend you have almost everything ready before you start the introductory lesson), let the children practice being Pollock with this fun computer game at JacksonPollock.org. Click on the big "Enter" image and then simply drag the mouse around to paint like Pollock! Double-clicking on the mouse will change the paint color. 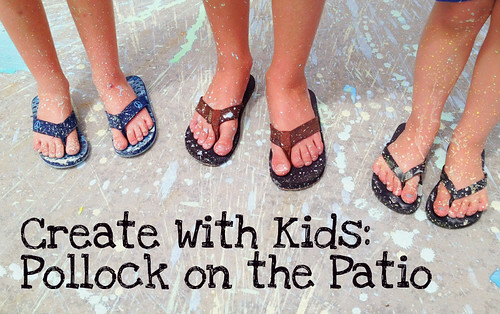 To make the paint, simply mix equal parts water and cornstarch. This is not a precise formula- just get the paint to a runny consistency without being too watery. If it is too thick, it will just clump on the cement. 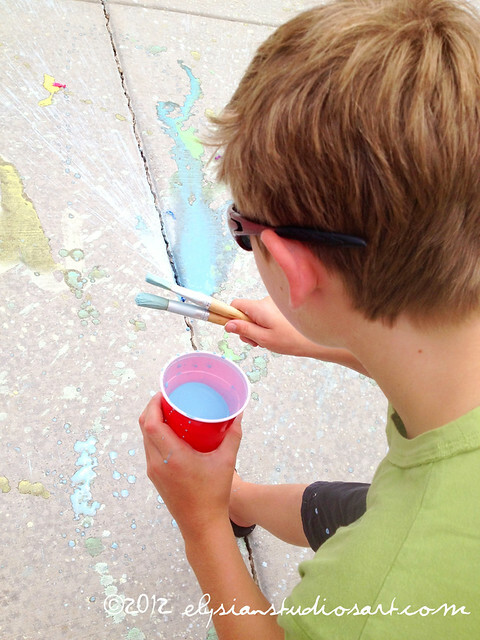 Color the paint with food coloring. Three different colors is sufficient. 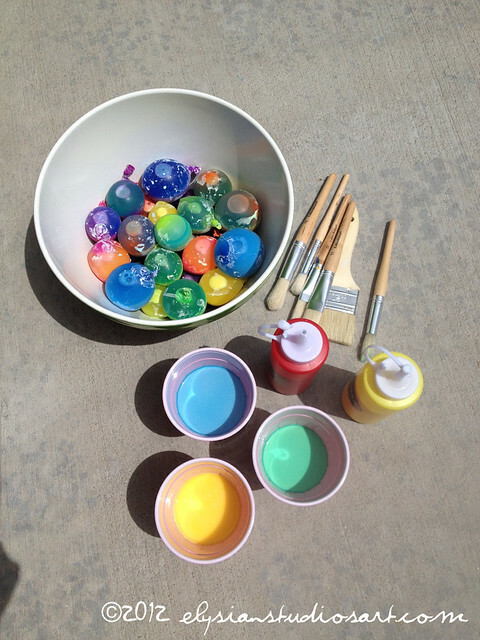 Pour some of the paint into the condiment bottles, and then use them to fill up the water balloons for "paint bombs." Unfortunately, I can't give you a spill-proof guarantee on this method, but the cornstarch paint cleans up easily. I found that condiment containers with a pointed nozzle worked best. Distribute the remaining paint among the cups and condiment bottles. 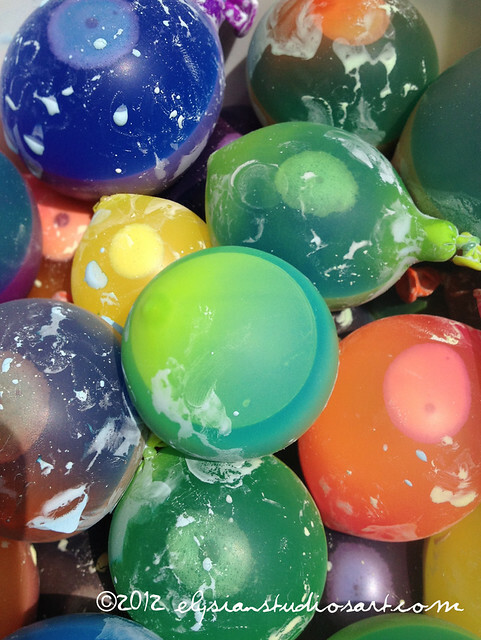 You now have three ways to paint: squirt, splat and drip! Let 'em loose! this looks like so much fun! and that link to painting on the computer was too cool~a great stress relief :-) the kids must have really enjoyed this! Oh to be a kid again - YOUR kid! 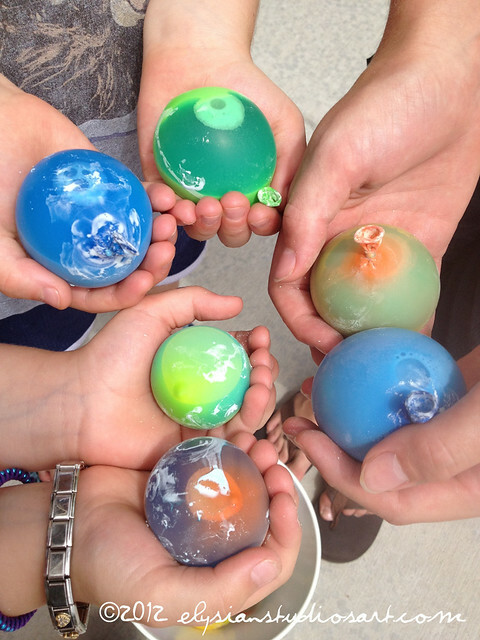 What a fun way to learn. Thank you for sharing a bit of the reason behind his work - as you know - I am not big on abstract but it helps to understand a little of why he painted in this way. 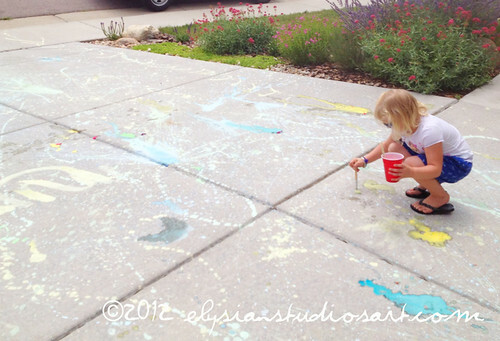 I certainly love the art in motion splashing around your house!!! We did have a lot of fun- the biggest challenge was taking the pictures- the kids moved around so fast I could hardly catch them! Thank you all for your comments, I am glad you enjoyed the post!